Is pizza the latest casualty in the Colonel’s war against bread or has it found new life? Once, in an act of pure human decadence, mankind twisted one of The Colonel’s great gifts, the Double Down, and turned it into The Double Down Dog, Destroyer of Worlds. Still, as mankind has always known, The Colonel forgives all. 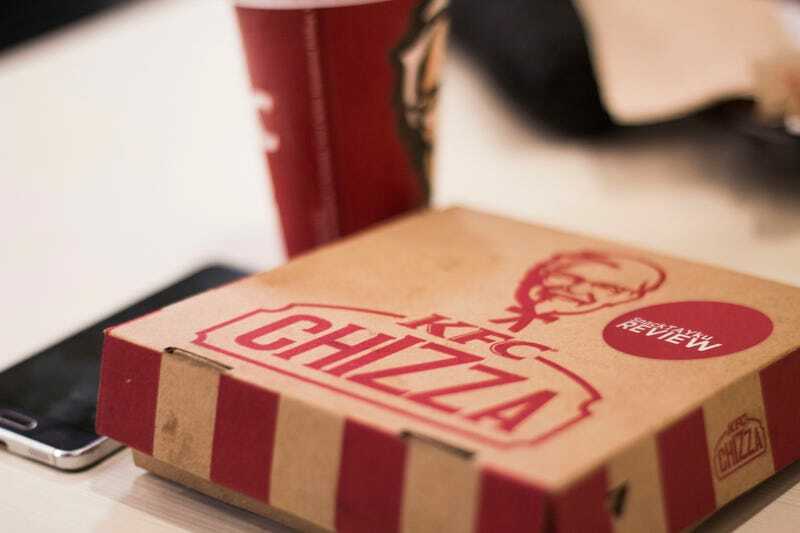 This time, his forgiveness comes in the form of the KFC Chizza. The Chizza is a small pizza with chicken for bread. Let that sink in. It’s as sinful as you can imagine. In contrast to the Double Down Dog’s atrocious chicken, the chicken here is tender and moist. It’s pretty good! The downside to this tenderness is the chicken crust’s propensity for breaking apart as you shove it down your food hole. Keeping the toppings on top of the chicken and the chicken intact as you lift it up is a veritable task. Chicken wasn’t meant to hold pizza toppings but the Colonel obviously doesn’t care. Tomato sauce, bell pepper, cheese. That’s pretty much it. Imagine that on top of a chicken and that’s exactly how it tastes. I guess it has pineapples too but I didn’t really notice them much. The Chizza, for such an absurd conceit, is surprisingly mundane. It’s also surprisingly good. I wanted it to be bad just so I could write a snarky article but, as we all know, The Colonel can do no wrong.